FusionDirectory 1.2.1 is here ! 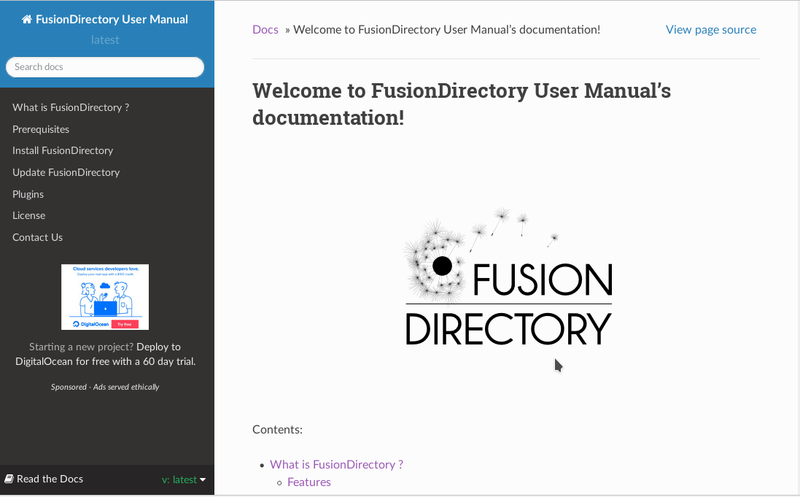 FusionDirectory 1.2.2 is here ! At the beginning of the FusionDirectory project we choose what was the easiest for us and what everybody knew, it was 5 years ago and the obvious choice for a small group at the time was to use a wiki. As the project grow we try to have this documentation in different languages and of course it failed because maintaining your documentation in sync in different language is very hard. Then as the project grow and become more and more successful and become used in production on research facilities and telecom operator, political party, the wiki proved difficult to maintain and at the same time unable to supply the documentation in the various format needed by the customers. After some test and due to the easy of use and ability to publish the documentation online on Read The Docs integrated with our gitlab via hooks. We have now nice developers and users documentation that are automatically updated each time we make a correction.